The What: Barco’s ClickShare now natively integrates with Zoom Rooms, the software-based videoconference room solution from Zoom Video Communications. The What Else: Remote collaboration in meetings is omnipresent. Barco is validating the use of ClickShare together with remote collaboration solutions in an open ecosystem. The cooperation of the products unleashes the full potential of the ease of the interactive content sharing experience. Combining ClickShare with other complementary solutions gives end users a consistent experience whether they are sharing locally or working remotely. 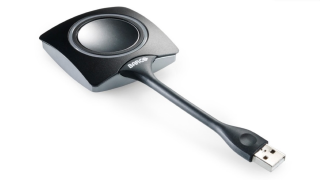 "Adding ClickShare to Zoom Rooms not only provides a consistent sharing experience for all but also provides simplicity and security, especially for visitors,” said Wim De Bruyne, vice president, meeting experience, Barco. “Millions of people are choosing Zoom Rooms as their preferred option to create a collaborative work environment. These clients will be pleased to learn that, with ClickShare, there is no need for them to install anything to share their content quickly in a safe way, or for IT to put complicated network configurations in place. The ClickShare portfolio adds great value to Zoom Rooms, from huddle spaces to meeting rooms and boardrooms." "Zoom is the industry leader in modern enterprise video communications, and our Zoom Rooms technology enables businesses to outfit any space with video, audio, collaboration, and scheduling capabilities,” said Oded Gal, head of product for Zoom. “Joining forces with ClickShare provides an excellent user experience, creating more opportunities for high-quality and effortless remote meetings. We look forward to continuing the collaboration with Barco to push the boundaries in cloud meeting experiences." The Bottom Line: ClickShare will be part of the Zoom Technology Ecosystem Program and will also share common channel partners. This integration allows ClickShare users to easily share content to their Zoom Room and remote attendees.